Take a bow, Roston Chase! He has almost single-handedly led Windies's fightback. He found some decent support from Dowrich and Holder and helped Windies recover from 113 for 5 to 295 for 7. Umesh and Kuldeep picked up three wickets each but the day belonged to Roston Chase. However, the 26-year-old would have liked to get those two runs and complete his fourth Test century. It's that man again! Umesh Yadav gives India a crucial breakthrough. Holder will consider himself unlucky as the ball was sliding down leg and Holder, who wanted to work it towards fine leg, got a glove to it which lands straight into the hands of Pant. India won't mind that as they have finally managed to break that 104-run stand. The new ball will also give Windies an opportunity to score freely. Umesh looked a bit wayward in the first over with the new ball and paid for it. Umesh dropped one short to Holder and the right-hander smashed it towards the deep mid-wicket region for a boundary. With that four, Holder brings up his eighth fifty. This has been a top knock from Windies skipper. India have finally opted for new ball. 50 partnership is up between Jason Holder and Royston Chase, both have looked extremely comfortably at the moment and among the most assured of all West Indian pairs. This pitch too looks like an absolute belter to bat on and Windies will need as many runs as they can get. That's it from us, but do keep a keep a tab on our site for post-day analysis and quotes copies. 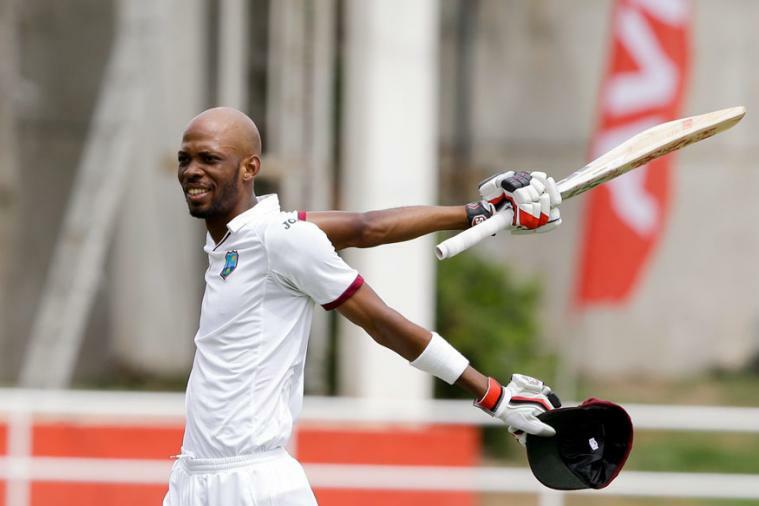 West Indies batsman Roston Chase said a return to his areas of strength - being patient and playing the ball on its merit - helped him succeed on the first day of the second Test against India in Hyderabad on Friday. 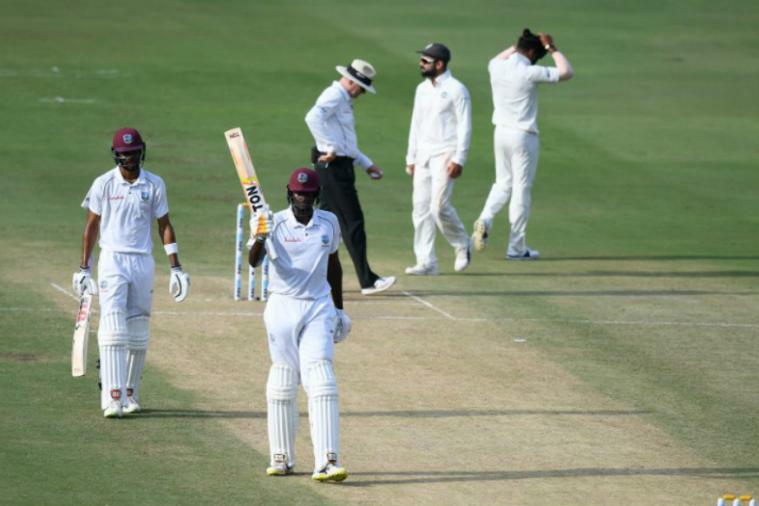 When stumps were drawn on the first day's play, Windies were 295 for 7 after 95 overs. Chase remained unbeaten on 98 and had Devendra Bishoo for company on 2. Roston Chase: I just took my time, more than what I did in the first game where I thought I just went away from my strengths and tried to over-hit the ball which is not necessary on outfields like the ones you get here. I was working hard with my coaches and as I said in the press conference, it is about believing in the processes and in your game and the results would come. I didn't worry about what was happening at the other end and was only looking to focus on my game. The spinners dominate the bowling in first-class cricket in the Caribbean so I am accustomed to playing spin bowling. I thought the wickets here would spin a lot more but they are really good. Remember a tall and lanky youngster who orchestrated an unbeaten 137 to deny India a victory in Jamaica a few years back? Chase has once again done it for Windies. While the other batsmen have struggled against Indian spinners, the 26-year-old has looked solid against the likes of Ashwin, Jadeja and Kuldeep. He did well in the Rajkot as well but couldn't convert it into a big score. If he does get those two runs tomorrow, he will get to his fourth century. Interestingly, all of his three centuries has come against the Asian sides. We have to talk about Umesh. The right-arm pacer was phenomenal in India's last home season but only got to play one out of eight Tests combined in South Africa and England. He finally managed to break into the XI in the Rajkot Test and did a decent job, considering most of the work was handled by the spinners. However, with Shardul injured, Umesh has done a brilliant job for his side today. He first got rid of Hope who was looking in good touch and then broke two crucial stands. In the first 40 overs, Windies scored 36 out of 113 runs (31.9%) by rotating the strike. Both Holder and Chase have been rotating strike on a regular basis and have kept the scoreboard ticking. They managed three singles off Umesh's over and then followed it up with a flick off Jadeja's bowling for two runs. India have finally opted for new ball. Windies didn't just miss Holder in the batting department in the first Test, the right-hander is also a very handy batsman down the order. He brings that much-required solidity and he has shown exactly that in this innings. Without taking too many risks, Holder has kept the flow of runs going. The two have now forced Kohli to bring Umesh back into the attack. It's just not been Jadeja's day! The left-arm spinner has been guilty of bowing short every now and then, and Windies batsmen haven't allowed him to settle in. The moment Jadeja goes full, they have driven him for runs. The 29-year-old needs to find that in-between length that has made him successful. India's over rate has been phenomenal. They have already bowled 82 overs and we still have close to 40 minutes left in day's play. Jadeja has gone for some runs and if that wouldn't have happened, India might have been close to 90 overs by now. LATEST UPDATE: Take a bow, Roston Chase! He has almost single-handedly led Windies's fightback. He found some decent support from Dowrich and Holder and helped Windies recover from 113 for 5 to 295 for 7. Umesh and Kuldeep picked up three wickets each but the day belonged to Roston Chase. However, the 26-year-old would have liked to get those two runs and complete his fourth Test century. Preview: The first Test went as expected. Will there be a twist in the second, starting in Hyderabad on Friday? India didn’t break a sweat against Windies in Rajkot, racing to their biggest Test win by an innings and 272 runs. The live telecast of the match will start at 9:00AM on October 12 (Friday). The match can be seen live on the Star Sports Network and live streaming will be available on www.hotstar.com. You can also follow our live blog for ball-by-ball updates and analysis on cricketnext.com. Catch all the action from the second Test between India and West Indies through our live blog. Their batsmen post 649 for 9 batting first, and then the spinners combined to destroy the opposition in less than 99 overs across two innings. More than the result or the margin, India will be happy with some of the boxes they ticked through the course of the Test for their bigger vision — the Australia tour. It started right at the top – debutant Prithvi Shaw began his career with a sparkling century, almost definitely sealing his spot at the top for the tougher challenges. Sure, a century against Windies at home doesn’t guarantee anything about his overseas game, but it’s at least a pointer in the right direction for the immediate term. Virat Kohli scored a century too, but that is nothing new, is it? It’s just routine for the run machine. Moving on, Cheteshwar Pujara scored 86 in quick time, showing he is in form. Rishabh Pant missed his century by eight runs, and in typical style, scored at more than a run a ball. With Wridhiman Saha unlikely for the Australia tour, Pant has sealed the wicketkeeper-batsman’s slot, but he’ll rue the missed Test ton. He’s still got time though, and will learn from the Kohlis in the team on how to never let opportunities waste. Another big positive for India was Ravindra Jadeja’s form, especially with the bat. That he’ll bowl consistently on one spot and keep things tight is a given, but it’s his batting that will give the Indian management confidence even for Australia. He made an unbeaten 100 off 132 balls – which wasn’t all bang-bang innings even when the situation allowed him to. This followed after an 86* at The Oval after being dropped for the first four Tests of the England tour. Between the two knocks, he also made a successful comeback to the ODI set-up in the Asia Cup. That Jadeja is batting with responsibility and showing signs that he can be the genuine all-rounder India desperately need, gives Kohli & Co options for the future. India have a couple of minor concerns too. When everyone else feasted on hapless Windies bowling in the best of conditions to bat on, KL Rahul fell for zero in the first over. More worryingly, he fell leg before – a dismissal pattern that’s becoming too frequent. Yes, he did score a ton in the last innings in England but that too was after a string of failures. With Mayank Agarwal breathing down Rahul’s neck, the Mangalore boy has to score aplenty and show who the first-choice opener is. Ajinkya Rahane couldn’t convert his start and managed only 41, extending his poor run in home conditions. Talking about Agarwal, this is perhaps India’s best chance to introduce the domestic run-machine. Given the strength and depth in the Indian batting line-up at home, resting any senior batsman would make little difference to their chances. Perhaps rest Kohli and give Agarwal a go? India might be tempted to think on these lines as they wouldn’t want to be in a situation where they have to introduce Agarwal straightaway in Australia. This Test, after all, is their last one before the tour down under. Similarly, India could also be tempted to test the likes of Mohammed Siraj or Shardul Thakur in place of Mohammed Shami just to test the bench strength. Windies, on the other hand, will welcome a couple of changes to their line-up. Kemar Roach will return after missing the first Test, while Jason Holder too should be back after an ankle injury. The only way Windies can challenge India is by getting wickets at the top, and these two pacers are their best bet. Holder also adds some solidity to their batting – something they desperately need. Two Windies batsmen got half-centuries in the first Test – Roston Chase in the first innings (53) and opener Kieron Powell in the second (83). Apart from these, Windies were abject, having no clue to R Ashwin, Jadeja and Kuldeep Yadav, who got his first Test five-for in the second innings. Can they drastically improve their game in such a short span? That’s doubtful, but they do need a bit of luck at the toss. Batting first perhaps gives them the best chance of competing, although in recent years India have been monsters at home irrespective of which way the toss has gone. The biggest motivation for Windies ahead of the game will be the questions on their ability at this level. Harbhajan Singh, in fact, raised questions over Windies' ability to compete in the Ranji Trophy. Tino Best did shoot back in a twitter banter, but the answers are best given on the field. Windies would want to do that and show that they can compete, and if they can upset India in the process, nothing like it.